What immediately comes to your mind when I say supermarket? Noisy crowds? Unending queues? So when a new store promised to cut all that out and take the grocery shopping experience beyond chopped veggies, muesli, soy milk, Kraft cheese and Real juices, I didn’t mind travelling all the way to Malad—to HyperCITY’s new imported gourmet food ingredients store. The meal counters were an added bonus. After you have filled the baskets, instead of going to the food court on the top floor of the mall, head to the live counters for some salad, sushi, sandwiches, pasta or Indian food. Or, just unwind with a beer and cigar, or a glass of wine. There’s also a juice bar and a tea and coffee bar. The order and cleanliness struck me as soon as I entered the store. First up are the stands of fresh produce — just about 4ft high, so you don’t have to look up or raise an arm to pick anything. The store stocks regular as well as exotic vegetables and fruits (from Granny Smith apples to Pecan pears and grapefruits), fresh herbs (such as oregano and parsley), bottled dried herbs, organic masalas and cooking oils. The cheese (Grana Padano, Smoked Scarmoza, Morbier, Leicester, Ricotta, Emmenthal, Gouda and more, besides many brands of processed cheese) and handmade Belgian chocolate counters are next, where you can taste before you take your pick. Then come the counters with cereals, biscuits, cookies, bread spreads, packaged teas, coffees, milk, juices, soup, ready-made meat stock and imported packaged water such as Perrier and Evian. The meats selection, which includes cold cuts imported from Milan and the UK, had me drooling. The seafood section had everything (or so it seemed) — from sea bass, salmon, monkfish, baby octopus, cuttlefish, swordfish and giant squid to John Dori. Tired at the end of my purchases, I made for the salad counter. The cool and tangy French Style Seafood Salad is a great starter. Follow it up with appetizers — try the Japanese chicken skewers and prawns. The Indian food buffet has a variety of vegetarian and non-vegetarian main-course dishes — Lamb Goulash, Goan Fish Curry, paneer makhni — which were quite delicious without being too rich. There’s a good variety of juices and shakes, but we suggest you try the aromatic teas instead. The Chamomile with Berries and Mint is a fragrant mix and is a perfect way to finish a meal (tea lovers, buy some leaves to take home, you’re going to crave it later). 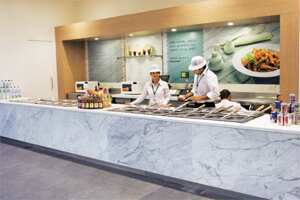 The meals are semi-cooked and then grilled or tossed together, as required, on the live counters, and don’t taste as good as freshly cooked food. So, for eating heated food sitting on a bar stool, the prices don’t seem justified. And since most products are imported, the prices are high — high enough to ensure only an occasional trip. Just a few purchases could set you back by a couple of thousand rupees (the tea mentioned earlier came at Rs440 for 100g, smoked gouda with pepper for about Rs400 for 250g, 200g of white rum chocolates cost about Rs1,000 and 250ml Waitrose olive oil, Rs699). The ready-made meals start at Rs125 to Rs250 for salads, Rs200 onwards for pastas and Rs125 onwards for appetizers and sandwiches. Juices and shakes start at Rs100, teas at Rs75 and coffees at Rs45.